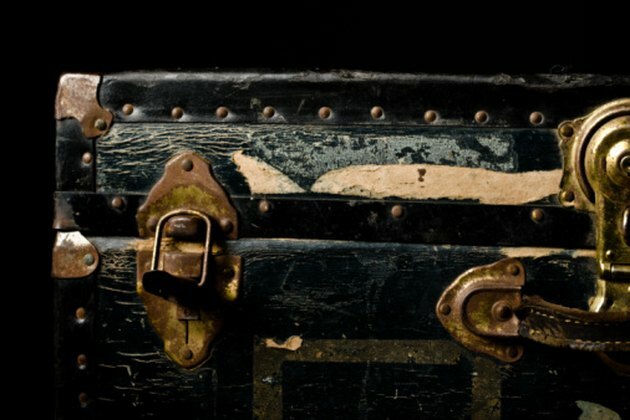 Storage trunks have an antique look and feel to them. In contrast to the sleek look of modern storage containers, storage trunks' solid, bulky, hinged parts represent older times. They usually come in standard colors like red, black and blue with gold or silver hinges. If you don't like those colors, or if you are tiring of your storage trunk's current look, you can paint it in a different color. Preparing and protecting the trunk is the key to preserving it for years to come. Decide if you will remove or tape off the hinges to the storage trunk. Removing the hinges will give you two pieces to paint: The lid, and the bottom trunk. Use a screwdriver or drill to remove the screws. Apply the painter's tape to remaining metal parts that cannot be removed. Curl the tape around any curved parts of the storage trunk. Clean and dry the entire trunk. Mix a combination of one part mild dish detergent to three or four parts of warm water into a bucket. Use a sponge to clean the trunk. Lay a drop cloth under the trunk and around the work area to keep the paint from spilling or dripping on the floor. Determine whether you will need to use a primer on the storage trunk before painting. Using a metal paint opener, open the can of paint you will use and mix the paint with a wooden stirrer. Brush on some paint in an inconspicuous area and let it dry. Check to see if the paint has bonded to the trunk. If the paint has seeped, you will need a primer to bond the paint to the trunk. Apply the spray primer to the entire storage trunk, if necessary. Use sweeping motions from left to right to avoid runs and drips, giving a even coat of primer to the trunk. Let dry completely before starting to paint. Apply the paint to the storage trunk. If you are using spray paint, follow directions on the can for best results. If you are using canned paint, open the can with the metal opener and stir the paint again with the wooden stick. Pour the paint into a paint tray before placing the first coat on the trunk. Apply the first coat of paint to the trunk. Use the brushes to cut in the corners and hard-to-reach spaces, working from the inside to the outside of the trunk. Coat the flat spaces using the rollers. Let the storage trunk dry thoroughly. Examine the storage trunk. If you find areas without paint, you will need to apply a second coat of paint. Apply the second coat of paint, if needed, the same way the first coat was applied. Let the second coat dry. Decide whether you will be varnishing your storage trunk. Varnish will protect the trunk from water damage and protect the paint from scratching or peeling. Apply the varnish according to the directions on the can.